Be it office parties or feasts in the midst of the woods, we need a camping cooler to store all our food as well as beverages. It’s important to store enough quantity and the camping coolers are designed to accommodate all the necessary edibles so that one never runs out of anything. 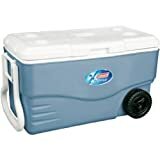 Besides keeping it fresh by maintaining the temperate, the camping coolers have many other features that one must look out for before proceeding to buy it. With every passing day, new innovative inclusions are made to make the coolers a better one. But there are a plethora of camping coolers available to satisfy all your needs. However, which one is the better one when compared to others? So in order to clear your confusion before buying, check the list of the best camping coolers below. Whether it is a long camping trip or a BBQ party, everyone wants to keep their food fresh. With the Coleman Xtreme cooler, you will actually be able to do so. 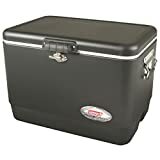 This cooler comes with an insulated lid and heavily insulated walls which make sure that your foods and drinks remain cold. Furthermore, it is highly spacious which means you will always have enough space for refreshments and food. Here is another great product from Coleman. This heavy-duty cooler with high-capacity comes with a classic retro design. It has a 54-quart capacity which means it provides enough capacity for your foods and drinks. The heavy insulation on the cooler walls retains the ice at least for 4 days even in extreme heat. The cooler is built in such a way with rust-resistant stainless steel framework which makes it extremely durable. Plus, this cooler comes with an easy grip handle to make it easy to carry. It looks like Coleman has some of the best coolers in the market and Coleman Coastal Xtreme is a testament to that. With a space of 120 quarts, Coleman Coastal Xtreme offers maximum storage for plenty of foods and refreshments. The cooler walls, as well as the lid, are highly insulated. Thus, it retains the ice for at least 6 days even in hot weather conditions. It is stainless steel framework along with UV Guard Protection against the sun that makes the cooler highly durable and perfect for use. Bring this cooler to fishing or boat trips to have unlimited fun. 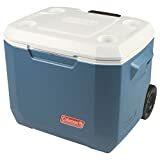 The Coleman Wheeled Cooler box is really ideal for picnics, tailgating parties and camping trips. It comes with heavy duty wheels which makes it easy to be carried around. With 50 quart space, this cooler is perfect for storing enough food and refreshments. The insulated walls along with the lid retain the ice for almost 5 days. So, you will never have to worry about anything while using this cooler box. Furthermore, the telescopic, as well as side handles, provide you better control over the box. 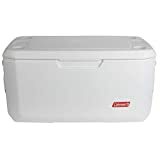 Another product from Coleman, the 48-Quart cooler is the perfect companion for small trips. Since it is very spacious, it can hold enough food as well as refreshments. 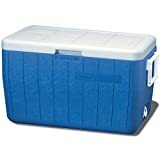 This cooler is heavily insulated thus it can retain the ice for 3 days. But it has a low percentage of CO2 insulation thus protecting the environment from carbon emissions. Plus, it comes with a leak-resistant drain which helps you to drain out the water without turning the cooler upside down. Your camping days will be glorious as this environment-friendly camping cooler will allow you to store all your edibles. Can fit in up to 160 cans, the Coleman cooler has ThermOzone which means that it doesn’t release the harmful HCFCs, CFCs or HFCs and thus keeps our environment safe. You do not have to worry about your contents as the Xtreme 5 technology will keep everything fresh for 5-days. Even the hinged lid comes with four cup holders and is leakage as well as rust proof. The two handles make it easy to carry and thus avoid sudden tilts. Build to perfection, this cooler that is extremely flexible can be used for any purpose. It comes with handles and wheels that help to move it anywhere you want. The superior thermal retention promises to keep your edibles fresh and further, prevents the creation of unwanted odour. Moreover, it is stain resistant and easy to clean. Isn’t this an amazing piece? 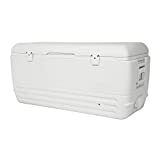 Besides having a classy look, the white cooler from Igloo has a body that is insulated with ultratherm and the lid helps to keep ice intact for 7 days at a temperate of 90 Fahrenheit. Made of polyethylene, the quick-access hatch gives you easy access to your food or beverages and further, preventing the escape of cold air. The threaded drain plug facilitates hose hook up and the loop feature of the swing-up handles is an added benefit. Furthermore, the dual snap-fit ensures air-tight closure. So, do consider this product. Homitt knows that what makes a great cooler and hence have combined thermoplastic polyether urethanes and high-density foam to create an exceptional piece. It further can be carried in two ways. First, you can just hang it from your shoulder by using the shoulder strap or carry it with side handles. The three-layer insulation process that comes with leak-proof insulated 840D TPU on the exterior and 420D TPU in the interior makes it water. Furthermore, it tolerates mold as well as mildew with the help of antimicrobial liner in the interior. 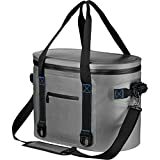 With food grade TPU coating on both the sides, this highly-durable cooler can keep your cold drinks safe for up to five days. Hence, wait no more. Probably the best and brand product you can wish to have when you are chilling out with your friends. Looks just like a small refrigerator; this 40-qt. capacity cooler chills every edible 40° below the temperature of the place. The durable cooler has a motor which is powered by both 110 V for the home outlet and 12 V for vehicle outlet. You can place all the contents in a nice organised way as it has trays for facilitating easy arrangements. Open the door from left or right, just get party ready with a trustworthy product of your fun days. Now make your picnics, camping, parties or events exciting by storing the maximum amount of beverages and food in any of these coolers. You can also use these for office or personal purposes and it absolutely serves every requirement well. Hurry up and start planning your feats as storing has become easy with the coolers.